Gourmet Girl Cooks: Friday Night is Pizza Night! I just can't say enough about how glad I am that today is Friday...not just Friday...but it's FRIDAY NIGHT and it is pizza night! 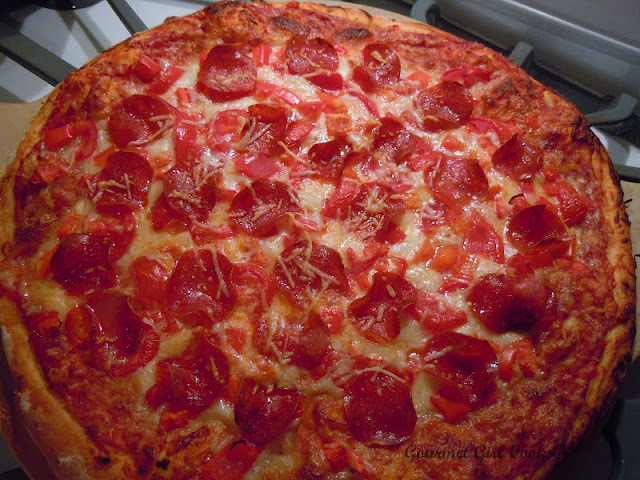 I made a pizza with Publix pizza dough, shredded mozzarella, our favorite Dei Fratelli pizza sauce...topped with Boars Head turkey pepperoni, diced red bell pepper, and chopped and seeded fresh Campari tomatoes. It was delicious! We are spending this evening waiting for this dummy, Walenda to fall off the wire as he foolishly tries to walk across Niagara Falls. Personally, I think he needs to find a new hobby...let's just hope he has good health insurance! I snapped a photo of our pizza below. Enjoy!